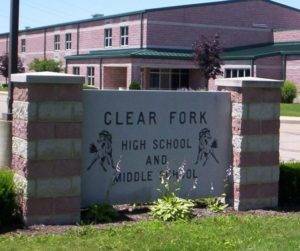 CLEAR FORK VALLEY – The Clear Fork Valley school board is considering a plan to shift its bus garage to a new location and free up space at the high school. The board, in a work session, toured a building at 99 East St., with owners Jim Jackson and Jamie Feick. Jackson and Feick said they are working on a plan to build a new sports complex at Dill Road and State Route 97 east. Superintendent Janice Wyckoff had approached the two, asking them if it would be possible to lease the building and shift the school’s bus operation there. Jackson said they are working with the Boosters and a bank to figure out if the sports complex could be built. It is estimated it would cost $1 million, he said. Feick said a five to ten-year lease could be possible. School board president Kyle Beveridge said a five-year lease would be more probable for the school. Computing the square footage of the building yielded an estimated lease cost of $50,000, officials said. Beveridge said moving the bus operation would allow the Future Farmers of America (FFA) to use some of that space, freeing areas within the high school for use by STEM. School board members did not oppose this potential change and Beveridge asked for a draft proposal on this project. During the regular school board meeting, two area residents spoke about plans to have the May graduation indoors instead of at the athletic field. Kelly Donaldson and Sherry Hoeflich, both of Butler, raised questions about the plan to hold ceremonies in the gym. Donaldson said construction at the athletic field means the ceremonies there could not be possible. She said the gym sometimes is overflowing when graduation is held there, and that it means some parents and others cannot attend. Hoeflich asked about the possibility of issuing tickets for the ceremonies. Beveridge said the decision has already been made to hold the ceremonies indoors. There will be 143 graduates at the May 19 graduation. The athletic turf project at the athletic field is going to receive $99,000 in donations from area businesses. Jamison Well Drilling made a donation of $3,000 for trenching and installation or waterlines, K.E. McCartney made a donation of $10,000 in engineering services for the project. Terra Valley had donated $35,000 for excavation services and Global Oilfield has donated $51,000. A change order was approved so that playgrounds for the two new elementary schools can be constructed. A contract was originally entered into with Gilbane Building Company for construction of the schools in Butler and Bellville. During negotiations budgets for the playgrounds were reduced and that money was moved back into the school construction budget. The schools are complete and now that money can be moved back and made available for the playground project.